Tuesday, July 5. Proof at the Four Seasons Scottsdale Resort held a contest inviting Facebook fans to suggest a burger with creative toppings for a BYOB or Build Your Own Burger. The winning submission would be featured for a week in July. I was so excited to find out that my Spanish-inspired burger won, and also that it would be featured for the whole month! On Tuesday, we were invited for dinner to launch the burger and I even joined the chefs in the kitchen. Click the photo below for details of the delicious burger Chef Joey Cavaretta created. Thank you Chefs! Wednesday, July 6. 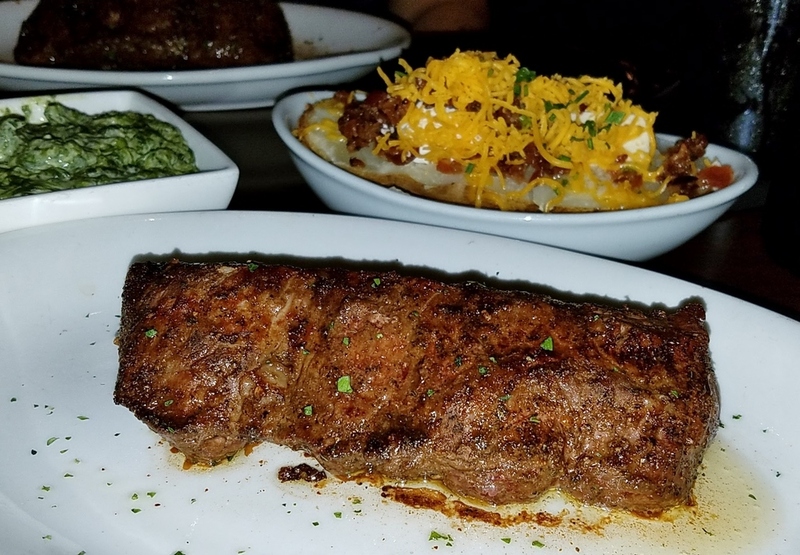 My favorite neighborhood steakhouse, Arrowhead Grill in Glendale, had a Buy One, Get One special on their signature Delmonico. It's my favorite cut so I didn't hesitate when my husband suggested dinner out. And bonus! We timed it right for Wine Down Wednesday where they offer special bottles at 50% per off. 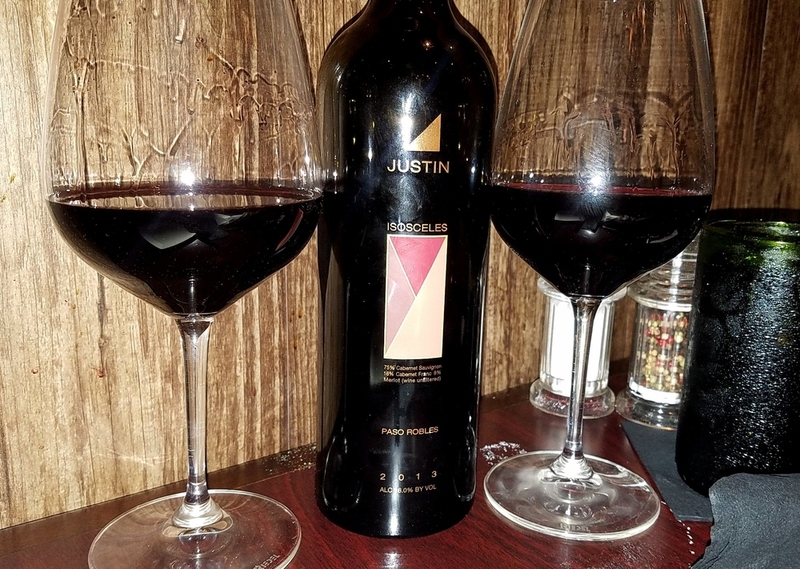 Justin Vineyards Isosceles was a perfect pairing. We also shared sides of baked stuffed potatoes and creamed spinach, and finished with the addictive butter cake. And a shout-out to Ronnie Buchanan for the great service. Thursday, July 7. On assignment for the Scottsdale Visitors Bureau, we spent an evening at downtown Scottsdale's weekly Artwalk. What a fun event. It was my first time (what took me so long? ), but not my last. The theme was International Artwalk and in addition to beautiful galleries like Casa des Artistas owned by one of my husband's high school friends, I admired Vietnamese artists at the Calvin Charles Gallery, and enjoyed entertainment such as Japanese Taiko Drummers and live Caribbean music and Japanese lanterns. Cocktail and restaurant stops included a new gem I had never been to before: Sel. Located right in the middle of the artwalk (it was a former gallery), it's a wonderful find that has only been open three months. Chef Branden Levine welcomes guests to a fine dining experience with a four-course, prix fixe dinner menu. You can also order a la carte, as we did when we stopped in for excellent cocktails and fabulous appetizers before our stroll. Look for a future in-depth feature when we return for dinner. Yellow tomato gazpacho with avocado-lime gelée, peach granité, tarragon oil drizzle. Cerise Fumée with Vida mezcal, Ancho Reyes chile liqueur, black cherry puree, lime juice and smoked sea salt. 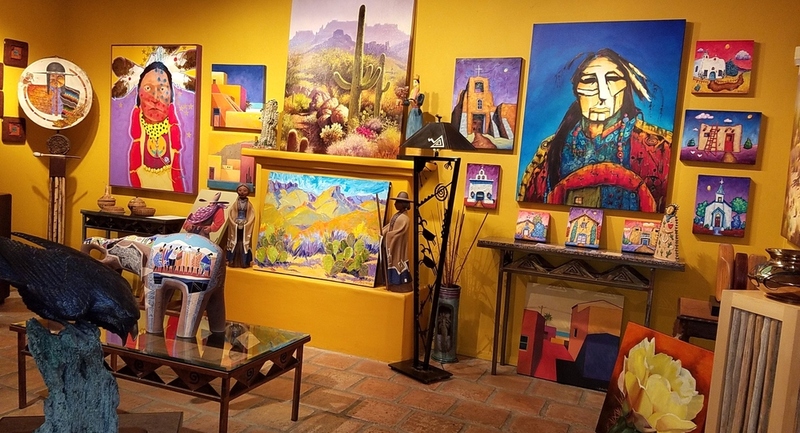 We strolled on to more galleries and our next two stops: Offering 35+ wines by the glass and live music, 5th and Wine was a perfect oasis to cool down and take a break between the galleries. Bonus was live music on gallery nights. Later, we ended our evening with cocktails at the bar of Citizen Public House. We also couldn't resist ordering another round of appetizers. Thanks to Elijah for the great recommendations and cocktails. Sunday, July 10. We weren't out, but since it was National Piña Colada Day, we had to whip some up at home. Monday, July 11. Uber announced the launch of its UberEats Phoenix program at DeSoto Central Market. Check out the current UberEats delivery area, which will be expanding in the near future. Invitees at the private event were treated to cocktails from Bitter and Twisted, an array of delicious food by The Larder + The Delta, Tacos Chiwas, The Vig, The Clever Koi, and, for dessert, High Spirited Cupcakes. Yes, you can now have dishes from Phoenix' best restaurants like these delivered right to your door. Aside from enjoying Lauren Klein's wonderful High Spirited Cupcakes at Bitter and Twisted, UberEats is now exclusively the only other way to get these delicious boozy cupcakes. Check back next week when my plans include visits to Tanzy, SumoMaya, Blue Hound Kitchen, VOM FASS, and a special Chef's Roll event at The Camby.